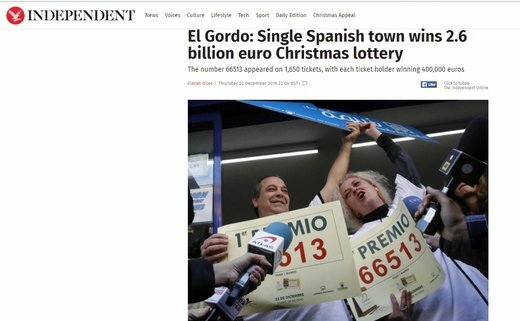 The El Gordo Lottery in Spain does not give out the largest individual prizes, but still people eagerly await its once a year draw. This is because it offers the largest total prize on offer – essentially it makes more people happy. This year the El Gordo gave out 25 million prizes which includes everything from the top prizes to the minor prizes. The total prize money this year is a huge 2.6 billion euros. One of those on whom fortune smiled this year is Marian Lopez. The four-month pregnant woman won one of the many top prizes. The lucky bank worker says she is thinking of home improvements. Vicente Villaverde has been buying tickets ending in 13 for the last 6 years, thinking that the number 13 will bring him luck. This year his patience was rewarded with a win. He says he will now enroll his son, who has Down’s Syndrome, in speech classes. He also plans to buy his girlfriend a new car. The draw itself was a very festive affair participated in by local schoolchildren and televised live. There was celebration all across Spain after the winning numbers were announced in the Dec. 22 draw. This year though, all 1,650 first prize tickets were sold by just one outlet in Acacias.